Against all rules - when our family heads for the South instead of going for Scandinavia, Scotland or other more moderately tempered regions. Lake Garda - Lago di Garda or Bénaco in Italian - is one of the exemptions we regularly plan for. It appears more than a German spin-off when you walk the rows in the campsite of your choice. And it rarely happens, that German is not spoken in restaurants or shops. But the ambiance is still mediterranean, a relaxed way of living makes up a enjoyable area for recreation with the family (expect maybe during the high-season when tourists keep flooding the popular holiday location and overcrowd streets and parking areas). Take the chance to visit all the cozy towns at the waterline (I prefer the South-Eastern area), walk the ancient oldtowns and choose an awesome café for a rest, travel the lonesome mountainous regions surrounding the lake area - and if ever possible use the low season. If you are more the adventurous holiday-maker: Every campsite has a swimming complex nowadays and the region features many attractions like fun and water parks. 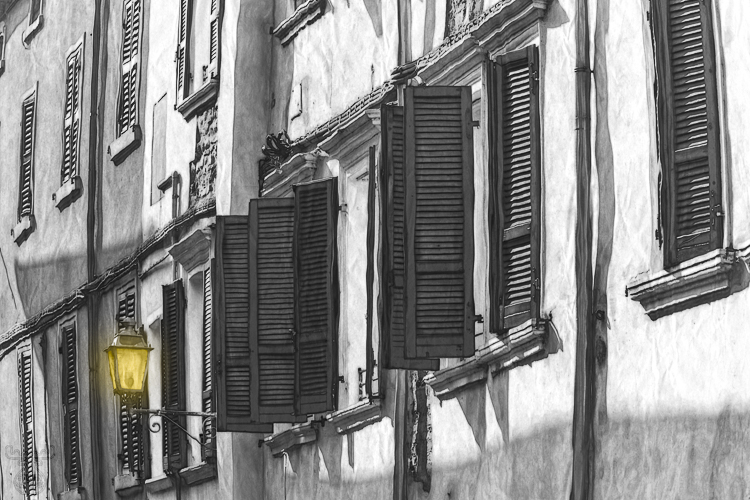 The chosen image shows typical windows shutters - and it lights up a light (for me in order to always find back :-). The town is Peschiera del Garda - located at the most South-Eastern end of the lake. It has a well preserved fortress and fortifications, the old town close to the water is awesome and invites for long walks.